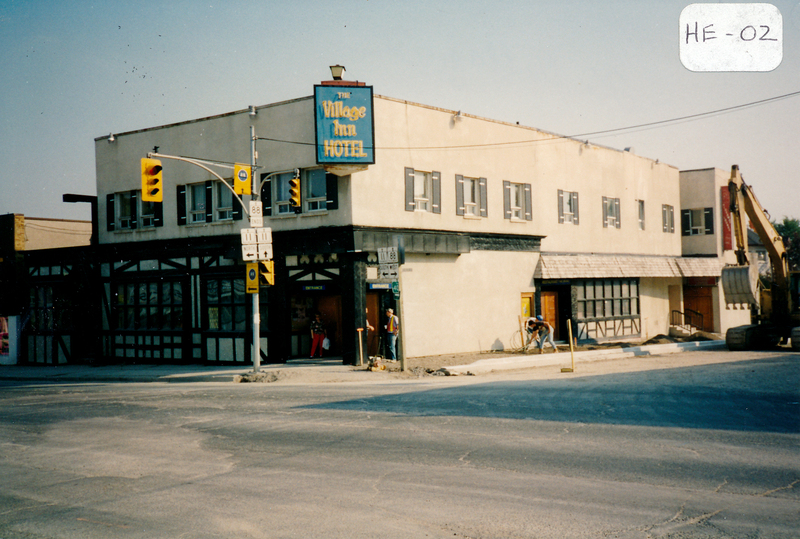 The Village Inn is located at 2 Holland St. East (on the corner of Holland and Simcoe Streets). There had been a hotel located at this site before the great fire of 1871. The building in this photo (1995) was built in 1920 in the Ontario Vernacular style. The original two-storey, cement building contained living quarters upstairs. One of the early inhabitants was Dave Watson, a farmer from the Scotch Settlement. He was one of the first to work with Professor Day in bringing about the drainage of the Holland Marsh. The ground floor was a grocery store in the early 1930’s (or before it was bought by Jim Gray and his wife). It was separated by a central entrance downstairs. Ken Morris bought the building around 1933 or 1934. Renovations were done by Art and Len Saint in 1937. The building was converted into the English Tudor-style hotel currently known as “The Village Inn”. A one-storey addition was added later (on the east side of the building) to contain a restaurant and ladies’ room. Under Jack Pong’s ownership, the addition became a Chinese restaurant. Additions were built later at the rear. Frank Sakowski ran the Inn for a while before it was sold to Bill Callum and Mr. Grant.